As many as 225 people have been killed or missing in heavy torrential rains and floods that have wreaked havoc in China with about 250,000 still trapped in the central Hubei Province. More than 680,000 people were affected and 10 townships swamped following continuous heavy rainfall from July 18 to 20, Tianmen city government in the Hubei Province said. Over 500 soldiers, 1,000 people and 62 speedboats have been sent for rescue work while more than 10,000 people have been sent to ensure the safety of river banks, state-run Xinhua news agency reported. At least 114 people have been killed and 111 others missing in Hubei province. Local authorities have evacuated nearly 300,000 people. Flooding and rain-triggered landslides have caused the collapse of 52,900 houses and damage to 155,000. Over 700,000 hectares of crops have also been destroyed, leading to direct economic losses of over 16 billion yuan (USD 2.4 billion). 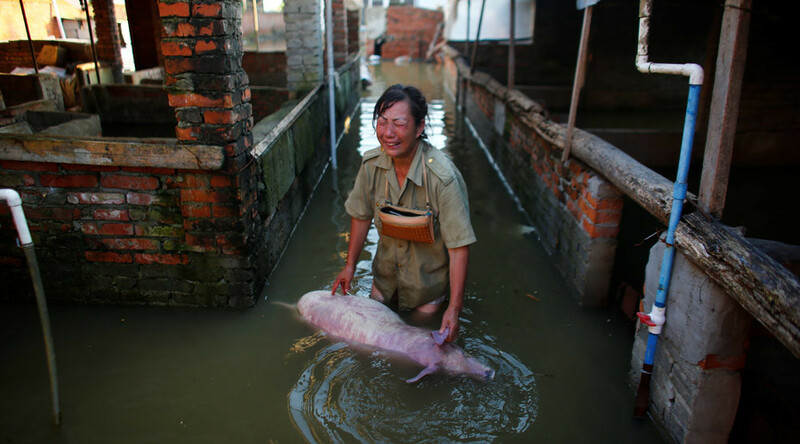 The worst-hit Daxian Village of Xingtai City was almost empty after a flash flood swamped it early Wednesday. At least 8 villagers were killed and one missing. "I heard people yelling 'flood' at about 2:30 AM. I woke up my wife and children and rushed out of door immediately. In no time the water level was above my waist,"said Zhang Erqiang, a local villager. "My wife and I panicked and we climbed to a tree, and stayed there for several hours until rescuers arrived in the morning," Zhang said. "But our daughter and son were washed away and their bodies were just found," he said. Only a dozen villagers stayed to watch over the village, while the rest of the residents had left to take shelter with their relatives elsewhere. The news of heavy casualties in Xingtai, just 400km south of Beijing, only began emerging over the past 24 hours when thousands of local residents took to the street to protest against the alleged belated disaster warning and ineffective rescue efforts, the Hong-Kong based South China Morning Post reported. Flood waters burst river banks and submerged at least 12 villages. Daxian village is one of the worst-hit, where at least nine people, including five school kids, are dead or missing, media reports said. Jingxing County, located in the west of the province, saw an average precipitation of 545.4 mm in the 19 hours between 1 PM Tuesday and 8 AM on Wednesday, surpassing the amount received by the county in the whole of 2015. There have been power outages, disruptions to communication and other infrastructure and road closures across Jingxing. The Corporate Controled/Owned media in the west has a nasty tendency to avoid reporting of how "Run Away Global Climate Destruction" is caused by Big Oil & Big Coal ! Today there is ample scientific proof that Big Oil & Big Coal will kill complex life on our small and sensitive planet.